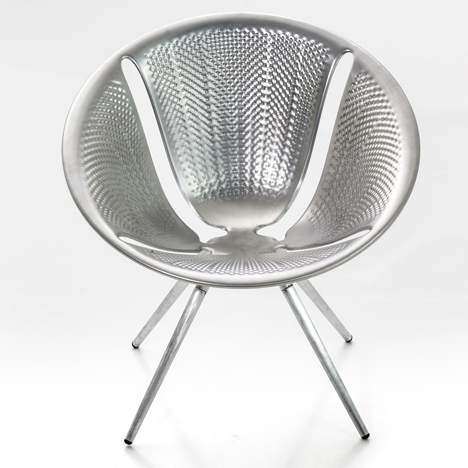 Milan 2014: British designer Ross Lovegrove has created an aluminium stacking chair for Italian furniture brand Moroso. The Diatom chair is made entirely from aluminium to make it suitable for both indoor and outdoor use, and can be stacked vertically without tipping forward. "It is entirely computer generated, resulting in a universal geometry that is ergonomically neutral, lightweight and providing a vertical stack that is rarely achieved," said Lovegrove, who wanted to explore contemporary aluminium-pressing technology developed by the car industry with this project. "My path in the designing of chairs is to embrace technologies that open up new possibilities and with this a commitment to exploring the moment where industrial investment can result in products that are aesthetically uplifting, long lasting and respectful of environmental issues yet economically accessible from a cultured design house to a wider audience," Lovegrove added. Each chair is produced in five stages: the first involves drawing aluminium, a process that involves using tensile forces to shape the metal. This is followed by a 3D laser-cutting stage, which defines the outer surface, and then another stage of drawing to create the inner parts including slots for the legs, all the raised elements and the outer edge. A fourth stage finishes off the seat and finishes the leg slots and the chair is then ready for its final assembly. The idea for shape of the design was generated from "the beauty and logic of natural lightweight structures familiar to architects and marine biologists who study intelligent growth logic," said Lovegrove. Its curved seat design is based on pieces of fossilised plankton that fascinated Lovegrove as a child, and the chair takes its name from one of these single celled organisms.